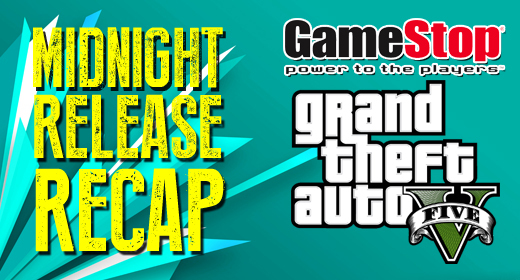 LIVE Midnight Release Recap: GTA Five! Check out our LIVE event we did for the Midnight Release of GTA V! Thanks to our friends at our local GameStop, Brandon and Josh were on-hand for the Midnight Release of Grand Theft Auto: Five! Also thanks to GameStop for letting us do some interviews, play some GTA Trivia with line-riders, and hand out some GameStop gift cards! Have you had a chance to pick up GTA Five yet? Let us know! Chris Anderson liked this on Facebook. RT @joshsteen: @Talkingbush You might want to pass this around: http://t.co/juinxNTmkv That’s a link to our stuff from Monday night.